Kosovo is drawing the attention of the United States, again. Before, the countries' engagement was mainly political, now the countries are getting down to business. The company of former US Secretary of State Madeleine Albright “Albright Capital Management LLC” has been shortlisted for the privatisation of PTK, Kosovo’s state-owned postal and telecom company. A government committee has made four other foreign entities eligible to bid for telecom shares. The list consists of “M1 International Limited” (British Virgin Islands), a consortium made up of “Columbia Capital” and “ACP Axos Capital Gmbh” (United States and Germany), another consortium comprising both “Twelve HORNBEAMS” and “Avicenna Capital LLC” (UK and Poland), and “Turkcell” (Turkey). The group of companies reaching this stage of the process has received mixed reactions. The authority behind the process praised the quality of the companies interested in investing in Kosovo, arguing the investments would make the country more attractive to more foreign direct investments (FDI). Annual figures presented by the Central Bank show that the FDI’s remain around the 300 million Euros in the past years. The head of the Chamber of Commerce, Safet Gerxhaliu, thinks that global companies such as “Albright Capital Management” have a strategic impact which could be used to improve Kosovo’s image, which Gerxhaliu thinks is off-putting to foreign investors. Transparency International ranks Kosovo 112 among 183 countries analyzed in the 2011 corruption index. Economic experts continue to rank Kosovo as risky for investment, and this is “troubling” to serious investors and big-name players in the global economy, said Ibrahim Rexhepi, who runs the strategic and social research centre STRAS. Meanwhile, the executive director of Riinvest Institute Lumir Abdixhiku claims that short-listed companies for the privatization of PTK mainly do not have telecom as their primary business, as is expected in these processes. Reviving Kosovo’s economy should not rely on old relations, but instead focus only on economic terms, according to the anti-corruption agency “Cohu”. The organisation published a report shortly after the short-listed candidates for the privatisation of the telecom were announced. The Cohu report reads: “By including “Albright Capital Management”, the privatisation of Kosovo's telecom industry risks turning into a competition of conflict of interests without business rational motives. This will harm fair competition, just like in 2007 when this group was part of the winning consortium of the mobile operator license [IPKO]”. 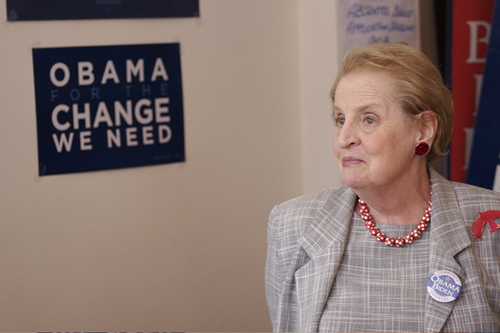 The organisation refers to the relations between government leaders and their lifelong appreciation for the support Albright has shown towards Kosovo since 1998 during the war and onwards. Also, Albright’s company has been listed among the partners in a team that won the first contract given to a private mobile operator, a process which continues to raise questions, even today. Media report that there is no confirmation from either the mobile operator IPKO nor the Albright’s company about whether it continues to hold shares in the private competitor of the soon-to-be-privatised public mobile operator. A bargain for the investor? The name of the new owner of PTK is expected to be announced some time in 2012, but the government has already evaluated the assets of the company and is expected to earn anywhere from a minimum of 300 million euros to a maximum of 600 million euros. Economic experts do not support the low price set by the government and consider the process a bargain for the investor. The public company dominates the domestic market with some 1.3 million users and has had a well-established infrastructure for more than a decade. Nevertheless, this privatisation process is expected to be the biggest in Kosovo. Until now, the state budget has accumulated a fund of 600 million euros from all enterprises sold in the privatisation process. It is interesting to point out that a Turkish company - “Turkcell”, is part of the final stage of the privatisation process. This confirms the presence of the Turkish economy in the process of privatisation and similar big investments in Kosovo. A consortium lead by a Turkish company has managed Kosovo’s only international airport since 2010, meanwhile another Turkish company is implementing the most expensive project in Kosovo’s history – the motorway connecting Pristina with Albania. Earlier this year, the government sold the distribution section of Kosovo’s Energy Corporation in an effort to revitalise the poor energy supply system. The Turkish company “Limak-Calik” won the contract for 26 million Euros, irrespective of the fact that about 200 million euros' worth of investments had been made in previous years by the Kosovo government. Not exactly an amount that helps the ambitions of the government to continue with expensive capital investments. The first motorway under construction has drained other capital investments, as the initial 600 million Euro price tag for the motorway is expected to rise. The privatisation money from the telecom sale was initially expected to be used directly to fill the gaps left in the budget by the expensive highway investment. The government even included the forecasted privatisation money in 2011 state budget, despite not even having closed the deal yet. Politically, this decision plunged the government into crisis when the minority party, the Democratic League of Kosovo (Lidhja Demokratike e Kosoves) opposed the privatisation process and - as a result - the country went to early elections. The ruling Democratic Party of Kosovo (Partia Demokratike e Kosoves) reclaimed the government with other coalition partners and continued the privatisation process. Other political entities in opposition slammed the parliament's decision to endorse privatisation of the state telecom company. Vetevendosje Movement continues to claim that the telecom is one of the profitable public companies in Kosovo and that the state budget can benefit from it. The company announced that a profit of 24 million Euros was made in the first six months of 2012, an increase of 10 percent compared to the same period last year. However, other experts and economic think-thank groups admit that years of mismanagement of the company has damaged the company. Financial reports of the company reveal that only in 2011, bonuses to employees reached 2.21 million Euros. Members of the board have received salaries of up to six thousand euros a month, when the average salary in Kosovo is below 300 euros. The fast-growing number of employees at this public company will come to an end together with the new owner. However, despite the fact that most of the privatisation steps have been completed, the authorities are expected to make the last leap to complete the process. In the first attempt to privatise the telecom sector, the process stumbled on the last hurdle. The attempted privatisation was cancelled in 2011 when one of the two remaining companies - “Hrvatski Telecom” - pulled out because of “corrupt affairs in the public company”. It referred to an ongoing corruption case which involved current and former high-ranking officials of the public company who reached allegedly damaging contracts with private enterprises. Failing to complete the process will not be a good sign for the parties responsible for the process: preparations for the privatisation have cost taxpayers in Kosovo about 5 million euros since 2008. The biggest privatisation process will test the old ties of Kosovars with the Americans, or the new strong partnership expanding Turkish businesses in the region. It might even give the market a chance to speak for itself in a form that benefits the citizens more.